Home /Knowledge Base /Must Read /FAQs – All the Common questions we receive (all in one page)! Home /Knowledge Base /Getting Started Guide /FAQs – All the Common questions we receive (all in one page)! Home /Knowledge Base /General Credit Repair Business Questions /FAQs – All the Common questions we receive (all in one page)! Home /Knowledge Base /FAQ /FAQs – All the Common questions we receive (all in one page)! A credit repair business can be run ethical and earn big profits. It’s an inexpensive business to launch and there are millions of people who need your help. Any new business takes time to learn. Learning software also takes time. Our software is awesome and super easy, that’s why we’re the leader in this business. Scroll down for ALL the frequently asked questions! How Does Credit Repair Work with Software? Many companies that use our software use this same workflow. Try it yourself! How do I get help with Credit Repair Cloud? All pages of the software have instructions and videos and we have many free guides. Are you a new user? Start by cleaning out and updating your web browsers. Next, visit our getting started guide to learn the steps of the software. If you need help with your software send a friendly support ticket or click here for a free 1-on-1 session so we can help you personally. If you need help for credit repair itself, get some training or read a book. Need legal advice? Consult with an attorney. Got a question? Click here to send us a support ticket email and we will respond quickly. Please be sure to write from the master email address on your Credit Repair Cloud account. Want live help? 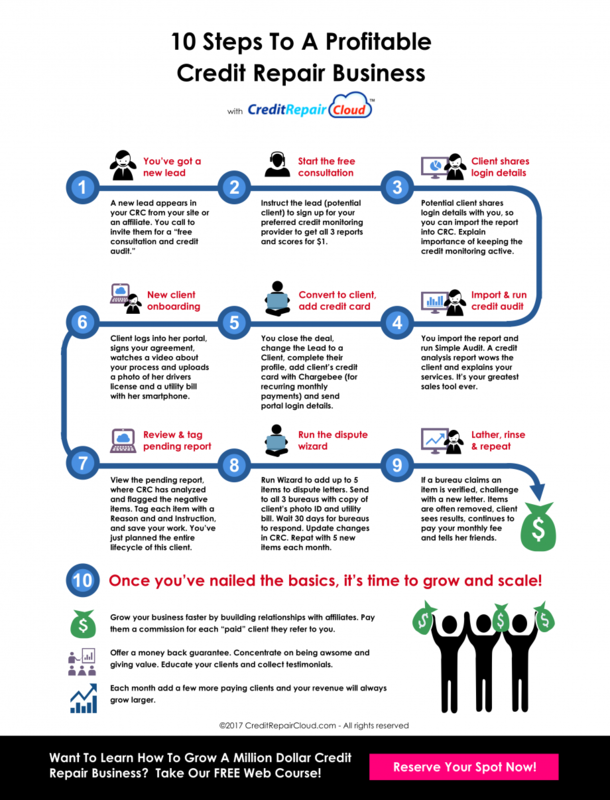 Schedule a free 1-on-1 session here https://www.creditrepaircloud.com/expert so we can help you personally! Yes, credit repair is legal and it works because of the law.The law is the Fair Credit Reporting Act, which was set up by the FTC to protect consumers. The FCRA gives you the right to dispute any item on a credit report. If that item cannot be verified it must be removed. That is the foundation of all credit repair. What does it cost to start a credit repair business? Close to nothing. This is a very affordable startup. All you need is a computer and a phone. How can I make money at Credit Repair? How much money can I make with a Credit Repair business? How do I collect money from my clients? Use our ChargeBee integration. That makes it super easy to create billing plans and apply them to each new client. ChargeBee is awesome. Once you’ve created ChargeBee billing plans, you can add a client’s credit card in that client’s profile. You can also add billing plans to your Web Lead Form (in MY COMPANY>WEBSITE TOOLS) and then add that Web Lead Form to your website — and then your clients can sign up with a credit card. It’s awesome! How do I get a website? Do I have to use your web hosting? I already have a merchant account. Can’t I just bill my clients without ChargeBee? It’s not our place to tell you how to run your business, but some states will want you to charge after work is done instead of before. How do you make money that way? Easy: Do some work, and then get paid for the work you’ve just done! Remember, you are being paid for “Document Processing” and “Credit Education” and not to “raise scores.” Yes, this is how all successful credit repair companies get paid. They import a report and send off a round of letters (about 10 mins of work) and then they charge a “1st work fee.” Then every month they send off another round of letters or click to update status of items that were removed (about 5 minutes of work) and they charge a monthly fee. This is why the monthly recurring model works so well for credit repair. Want to see the profit potential of the recurring revenue model? Click here www.creditrepaircloud.com/calculator. How do you increase credit scores? I got my first client, now what? Can I order the credit reports for the client? Does my client’s score suffer a hit if he orders his own report? How do I import a credit report? Which Providers can I import from? What if my client gives me a report from another provider not listed? Help! I cannot right click in the credit report! Which dispute letter do I choose? How many items can I dispute at one time? Send as few as possible and never more than 5 per month per bureau. This will keep your letters from being flagged as frivolous, which is something difficult to overcome. Do I have to include a Photo ID and Utility Bill with my dispute letters? You only need to send them with a Credit Bureau Round 1 dispute. You do need to send a copy of a government issued photo ID. If your client does not have a Utility bill, an insurance bill will also work or even a phone bill. They must see some official proof of address or the dispute letter will often be rejected. Who signs and sends the dispute letters? Should i put legalese into my dispute letters? Absolutely not. Credit Repair Letters are sent “as if” they are from the client so this will definitely be a red flag unless the client is an attorney. The best dispute letters are very simple and very short and just state simple facts as concise as possible. Should i send all letters certified mail or regular? This is up to you. Sometimes you might want to send regular mail (like for a round 1 letter) and other times, you might want to pay extra for the certified for tracking if the bureau or creditor is stalling or it’s a particularly important letter. This is all up to you. Why send everything by snail mail? Can’t I do this online? How do I stop “Credit Repair Cloud” and your URL from printing on my letters? How do I update Credit Repair Changes? Should I import again? My clients are undermining my work by applying for credit and keeping high balances. What do I do? Where can I get credit repair books and credit repair training? How do I get started with my first client? Should I buy ads and advertise? What are the laws and legalities of starting a credit repair business? Each state is a little different. Check with your state and consult an attorney. We are a software company. We can’t give you legal advice. Do I need a license for Credit Repair? We’ve never heard of a license for credit repair. We do have a “business license” with our city and that costs us about $99/year. Our neighbor who owns a flower shop also has one. Do I need a bond? You might. A few states do require them, but if one is required, you only pay a fraction of the cost. Click here to see if one is required in your state: http://www.bondsexpress.com/credit-services-organization-bond/ Bonds Express can answer any questions you may have about bonds. What should I know about Compliance? This is one of the biggest mistakes a new credit repair business owner will make. Never make false claims or guarantees. Credit repair cannot work that way. Be honest. You cannot promise a score increase in 30 days or removal of everything negative. But you can explain how the credit repair process works. Give some education to the client on how they can speed up the process by not applying for new and paying bills down, and you can also give some examples of stats on your other clients, for example: “Our average client sees 5-10 items removed in the first 3 months, but all clients are different.” If the goal is to grow and scale your business, take it slow and always be honest and transparent. This is another very common mistake made my new credit repair companies. You cannot dispute everything. Consult with the client and only dispute what the client tells you to dispute. Simple method: Go over the report with the client. The client should tell you which items are accurate and which items are not. More complex method: Use our “client’s choice” module. Once that is enabled (in My Company>Portal>Client’s Choice, the client must make the choices after the report is imported. A cancellation notice giving clients 3 business days after signing to legally cancel.